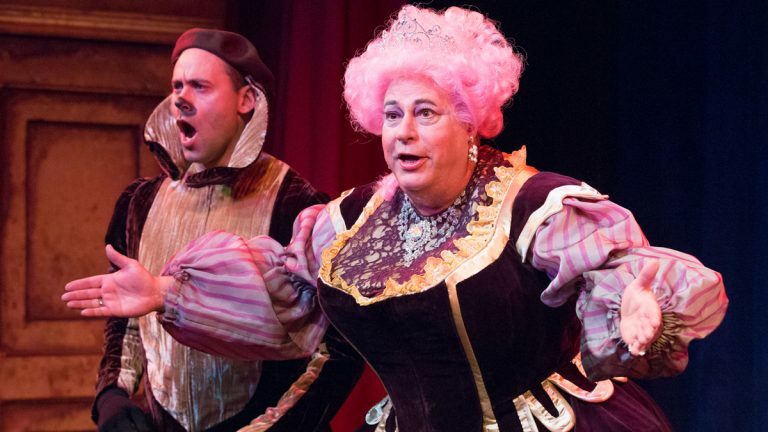 "The Three Musketeers (The Later Years): A Musical Panto," People's Light's annual holiday panto, takes to the stage through January 10. Pictured: Dito Van Reigersberg and Mark Lazar. Photo by Mark Garvin. The 150th anniversary of “Alice’s Adventures in Wonderland,” plus integrating cultures, and pantos! Robin Bloom shares her picks for what to check out this week. 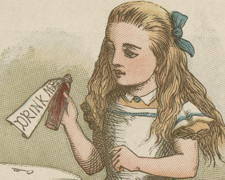 The Rosenbach of the Free Library of Philadelphia marks the 150th anniversary of the internationally beloved story by Lewis Carroll with Down the Rabbit Hole: Celebrating 150 Years of Alice in Wonderland. The exhibit explores the many facets of the literary classic with three parts. Part One, Wonderland Rules: Alice at 150, looks at the profound cultural legacy and the continuing impact of Carroll’s famous work. Part Two, Alice in Phillyland sheds light on the story of Alice and Philadelphia, including the internationally renowned purchase of the manuscript at auction by Philadelphia book dealer A.S.W. Rosenbach for a world-record price. Part Three, Why is a Raven like a Writing Desk? Lewis Carroll’s Riddles, Puzzles and Games gives visitors the opportunity to learn more about Carroll as a mathematician and puzzle lover, trying their hand at some of his mind-bending inventions in an interactive gallery, through May 15, 2016, 2008-2010 Delancey Place, Philadelphia. Related programs and events include Tea and Tarts with Alice at the Free Library’s Culinary Literacy Center, November 19, 6pm, plus hands on tours and more. 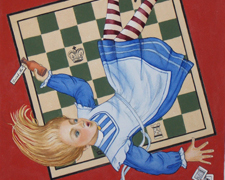 Dallas Piotrowski, known throughout the region primarily as a realistic painter of the natural world, has been creating an ongoing series of Alice in Wonderland paintings (pictured) for a number of years. Her series provided the inspiration for the Trenton Museum Society’s exhibit, Alice Revisited, a celebration of Carroll’s fanciful story. 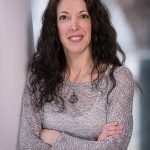 Alice has inspired many other artists as well, including Csilla Sadloch, Eric Schultz, Valerie Young, and Rhoda Kassof-Isaac and poet Joseph Longino, who produced a series of digital collages and companion poems retelling the Alice in Wonderland story. The exhibit is on display through January 9 at Trenton City Museum at Ellarslie, Cadwalader Park, Parkside Avenue, Trenton, NJ. Related programs and events include The Mad Hatter’s Tea, Sunday, November 29, and Alice in Wonderland Cabaret, January 8. Photo courtesy of Trenton City Museum at Ellarslie. 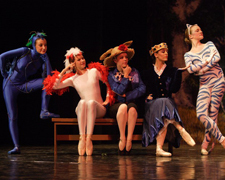 Metropolitan Ballet Academy and Company pays tribute to the 150th anniversary of Lewis Carroll’s Alice’s Adventures in Wonderland with a whimsical story ballet for children, Alice in Wonderland and The Little Engine That Could (based on the tale by Watty Piper), Saturday, November 21 and Sunday, November 22, 1pm and 4pm. Choreographed by Jennifer Clagett Sommers with performances at Abington Friends School, 575 Washington Lane, Jenkintown, PA. Enjoy the Mad Hatter’s Very Merry Un-Birthday Bash in between performances on Sunday, November 22, 2:30pm. Photo courtesy of Metropolitan Ballet Academy and Company. BalletX stretches movement to its limits with the world premiere of Beasts. 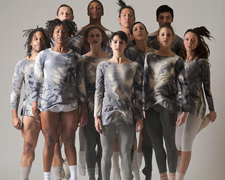 The resident dance company of the Wilma Theater, BalletX sashays onstage for a tenth season with Fall Series 2015, an evening-length world premiere by internationally renowned choreographer Nicolo Fonte, exploring the sociological debate of nature versus nurture and how biology and environment converge to form one’s identity. Performances run November 18-22, 265 South Broad Street, Philadelphia. The unique dance appreciation initiative, The X-Process, returns with interactive lectures, artist conversations, and special events that take participants behind the scenes. Photo by Alexander Iziliaev. Kun-Yang Lin/Dancers premieres Home/S. 9th Street, a personal and universal exploration of the immigrant journey and finding a new identity in America, November 19-21. The new piece draws on the stories of diverse community members along the South 9th Street corridor where Kun-Yang Lin/Dancers’ dance venue, CHI Movement Arts Center, is located. Under the direction of Artistic Director Kun-Yang Lin (himself a Taiwanese immigrant) at FringeArts, 140 N. Columbus Boulevard, Philadelphia. Photo courtesy of Kun-Yang Lin/Dancers. Curtis Opera Theatre performs Massenet’s Manon, November 19-22 at the Prince Theater, the enduring romantic drama about the naïve and beautiful Manon, who seeks love and is seduced by luxury, and finds that she cannot have both at once. Based on the 1731 novel L’histoire du chevalier des Grieux et de Manon Lescaut by the Abbé Prévost with libretto by Henri Meilhac and Phillipe Gille, the fully staged production is conducted by David Hayes and directed by Stephanie Havey. Performed with the Curtis Symphony Orchestra and sung in French with English supertitles, 1412 Chestnut Street, Philadelphia. Photo courtesy of the Curtis Institute of Music. 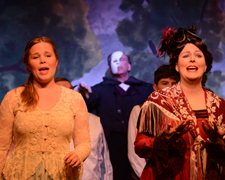 People’s Light continues its tradition of staging holiday pantos that take well-known folk tales and favorite stories and change them in a surprising and interesting way, with a reimagining of their popular The Three Musketeers (The Later Years): A Musical Panto, by Kathryn Petersen. 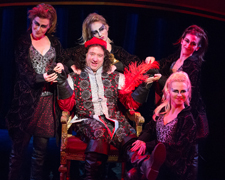 The silly and madcap production stars Philadelphia favorite Dito van Reigersberg (a.k.a. Martha Graham Cracker) and Robert Smythe, master puppeteer and founder and Artistic Director of Mum Puppettheatre. Directed by Pete Pryor, with music and lyrics by Michael Ogborn, through January 10 at 39 Conestoga Road, Malvern, PA. For all ages. Special events include conversation about the production with the artists after select Thursday evening performances and Panto Brunch with the characters. Photo by Mark Garvin. Ardensingers present Panto of the Opera, a retelling of the popular musical the “Phantom of the Opera,” mixing theatrical hijinks, music, special effects, audience participation, and low comedy, for all ages, November 20, 8pm and November 21, 2pm and 8pm, Arden Gild Hall, where the group has been performing the works of Gilbert & Sullivan for over 65 years, 2126 The Highway, Arden, Delaware. 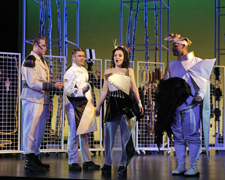 Written by Stuart Ardern, with stage direction by Ken Mammarella and music direction by Helene Furlong. Tickets are going fast for Black Nativity, onstage at Theatre Horizon. The powerful retelling of the classic Nativity story, written by legendary poet Langston Hughes, features an entirely black cast and local choirs or singing groups. 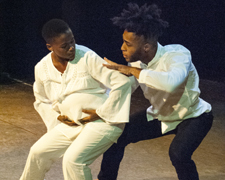 The reimagined family-friendly musical journey travels from Ancient Africa to post-Katrina New Orleans with African and contemporary dance, gospel favorites and storytelling, depicting a downtrodden people inspired by the arrival of a savior. Directed by Ozzie Jones with musical direction by Will Brock and starring Sanchel Brown and Kingsley Ibeneche, through December 6, 401 DeKalb Street, Norristown, PA. Photo by Amy Scheidegger. The Drama Group presents the romantic comedy Prelude to a Kiss by Craig Lucas, through November 28 at The First United Methodist Church of Germantown, 6001 Germantown Avenue, between High Street and Walnut Lane, Philadelphia. The show about a couple who, after they are married, find their love and commitment to each other tested by a supernatural event ran on Broadway for a year with 440 performances and was nominated for a Tony Award and was a finalist for the Pulitzer Prize for Drama. Directed by Robert Bauer and featuring Jackie Sherman as Rita and Dustin Karrat as Peter. Photo courtesy of the Drama Group. 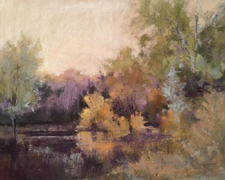 The 12th annual Scenes of the Schuylkill River Heritage Area Art Show returns to Montgomery County Community College, celebrating the Schuylkill River region through art with 92 original works selected from 163 submissions by juror Charles Stainback, Director of Art at the Berman Museum, Ursinus College. Most works available for purchase through December 11 at the College’s Fine Arts Gallery, North Hall, West Campus, 16 High Street, Pottstown, PA. The show will be extended to the Valley Forge National Historic Park in January. Pictured: Autumn Reflections: Cathy Grygiel, third place. Photo courtesy of Montgomery County Community College. On display at Indigo Arts Gallery is A World of Masks, featuring a collection of masks from Africa, Asia, the Americas and the Pacific. The exhibit highlights dance, festival and ritual masks of wood, metal and papier maché from countries including Cameroon, Congo, Gabon, Guatemala, Haiti, India, Indonesia, Ivory Coast, Mali, Mexico, Nepal, New Guinea, Nigeria, Peru and Sierra Leone, through January 2 at Crane Arts Building, #104, 1400 North American Street, Philadelphia. 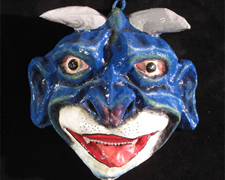 Pictured: Blue Devil Carnival Mask (#hmsk-41) Rony M. (Jacmel, Haiti) Papier Maché. Intercultural Journeys showcases an unconventional pairing of classical music from northern India with progressive Hip-Hop and Go-Go music. 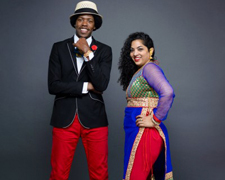 Nistah Raj and Grammy nominated artist Christylez Bacon play the tabla, keys, and saxophone for Hip-Hop Meets Hindustani, Friday, November 20, 8pm, Ibrahim Theater, International House, 3701 Chestnut Street, Philadelphia. Catch a pre-concert talk with the artists beginning at 7:15pm. Intercultural Journeys seeks to promote understanding in pursuit of peace among people of diverse faiths and cultures through dialogue and the presentation of world-class performances in music, dance, the spoken word, and other art forms. 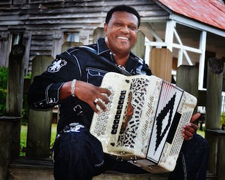 Grammy Award-winning Chubby Carrier and his Bayou Swamp Band were supposed to play the Philadelphia Folk Festival in August but couldn’t make it due to bad weather. Join the Chubby Zydeco dance party on Saturday, November 21, 2pm at Union Transfer, 1026 Spring Garden Street, Philadelphia. Doors open at 1pm. Admission is free! RSVP required.